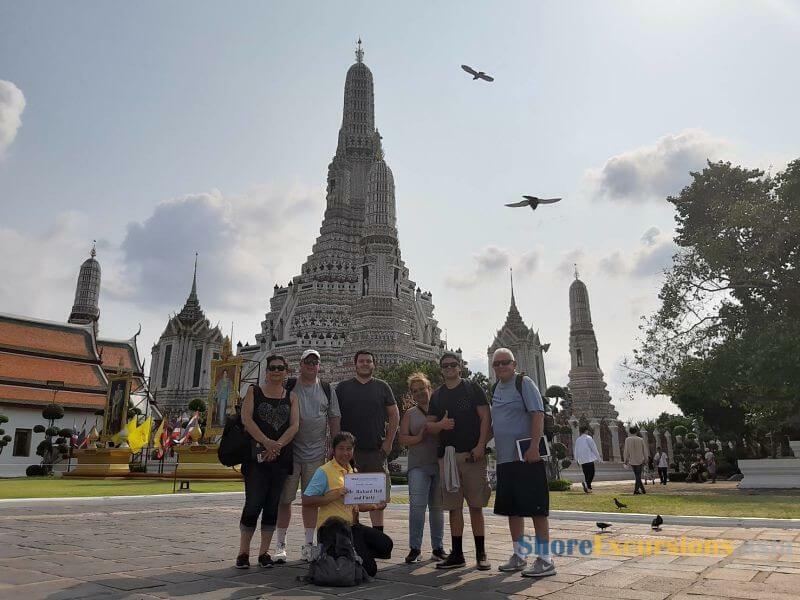 If Seoul is well-known as the crowded and bustling city with the car, high-rise buildings, Jeju shore excursions present the place known as the island of peace and also considered as ” the Hawaii of Asia”. 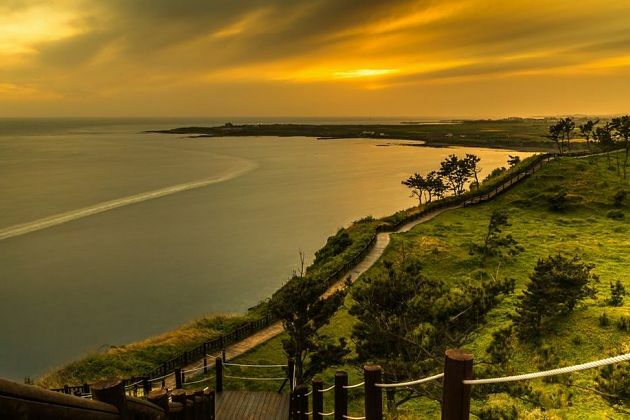 Jeju day tours are known as the paradise for couple honeymoon and the sweetest vacations, With With 1.800 km2 area and population of 550,000 people, Jeju Island is under great influence of sun and wind and geological formations that create a peaceful and graceful Jeju with picturesque scenery and friendly people. 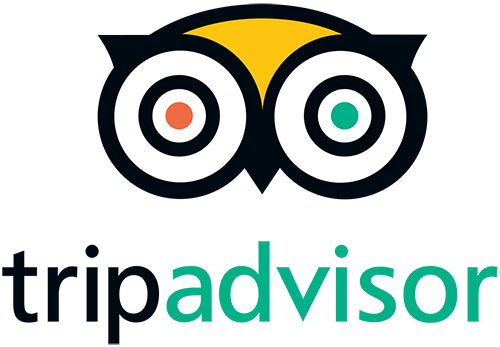 Impressive volcanos, Seongsan llchulbong, Phoenix Island, Jeju Stone Park, Saseonghyeol Shrine, Yakcheon-sa Temple, Lee Jung-Seop Art Gallery & Park, Iho Tewoo Beach, Jeongbang Pokpo Water Falls is the most attractive destinations in Jeju Island day tours. 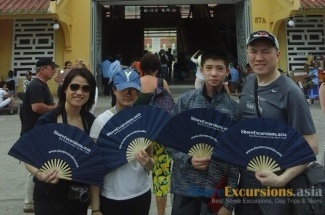 Asia Shore Excursions is offering many interesting Jeju shore excursions for cruise passengers stop at Jeju port, Korea. 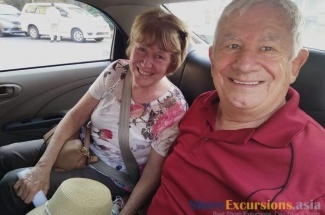 Please contact us to get the best Jeju shore excursions. 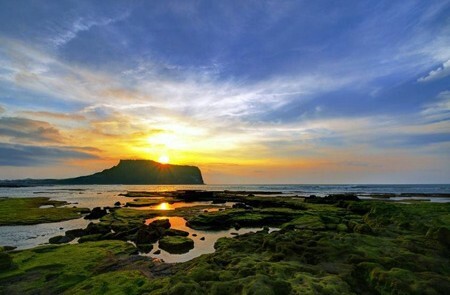 If you do not find any suitable Jeju tours and day trips, you can surely tailor a unique excursion to meet your interests. 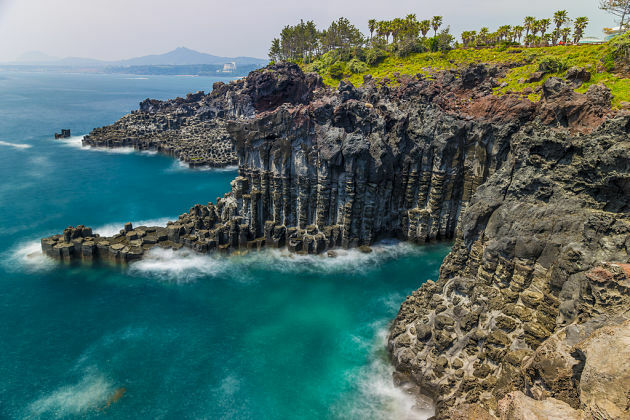 Jeju – one of the most popular attractions in Korea shore excursions – is the largest island in the whole country. 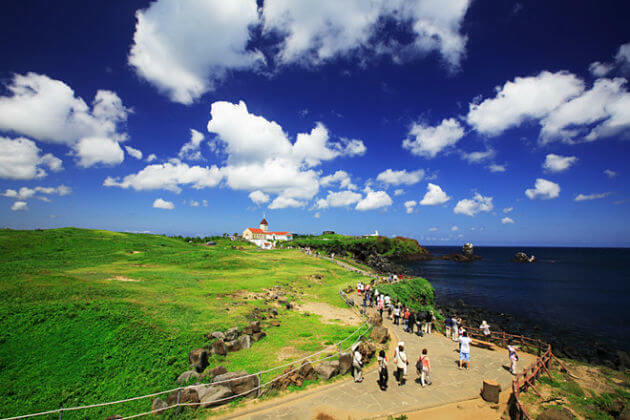 Lined up by stunning beaches, lush countryside, and luxury restaurants, Jeju day tours is a dreamland to explore. 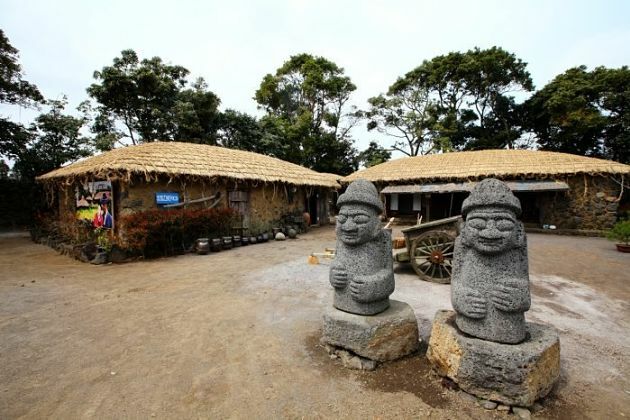 Your Jeju shore excursions can be a strange experience with a visit to Seongeup Folk Village which has the age of over 600 years hiding at the foot of Halla Mountain. The village is covered by around 3000 thatched-roof houses with the wall made from the porous basalt rock collected from the volcano. It served as a typical folk village containing a plenty of cultural treasures including tangible and intangible things. 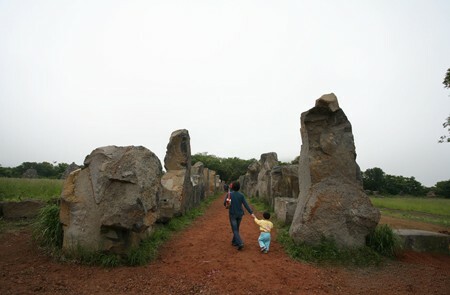 The tangible treasures here are large millstones, stone statues, stone monuments, fortress ruins, ancient government offices, Confucian shrines, and schools. While the intangible treasures including tradition cuisine, folk songs, local folk craftsmanship, and the Jeju special dialect. Moreover, many zelkova and nettle trees which are hundreds of years old stand at the center, serve as huge guardians for the village. After opening, O’Sulloc Green Tea Museum rapidly became a cultural and relaxation space which is friendly with the environmental. 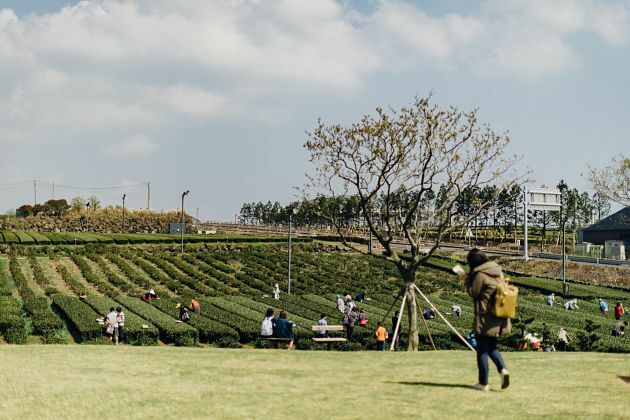 The museum is the combination of Western and Eastern tea cultures and modern practices – the best place to taste a savory cup of tea in Jeju day tours. The shape of the museum is like a huge green teacup with a grass square, a beautiful pavilion, and a poetry bridge. The museum exhibits a collection of old implements to make tea which can date back to the 3rd century. More than tea only, you can visit many shops to pick up some products made of tea such as shampoo, cake, and ice cream. 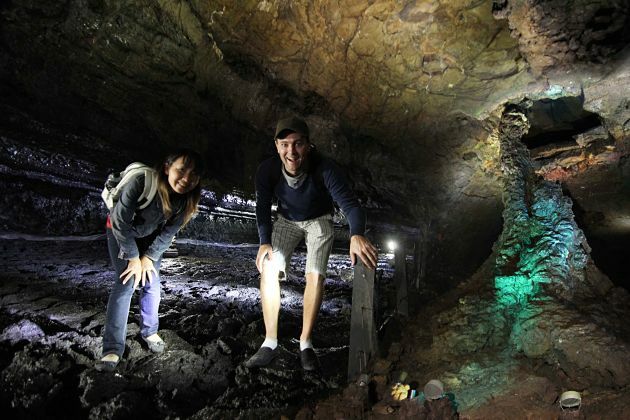 Manjanggul Lava Tube is one of the largest lava tubes in the world with the length is 13 kilometers, the width is up to 18 meters, and the height is nearly 23 meters that highlights your Jeju shore excursions. The tube had been created by lava flowing from the peak of the volcano to the surface for thousands of years. Walking into the tube, you can admire the multi-colored carbonate decorations like a majestic sight in the sky. The temperature is around 11 – 21℃ which creates a cool atmosphere and making it become an attractive place to hide from the hot summer. Don’t be too surprised that there is an ocean of bats living in the tube. 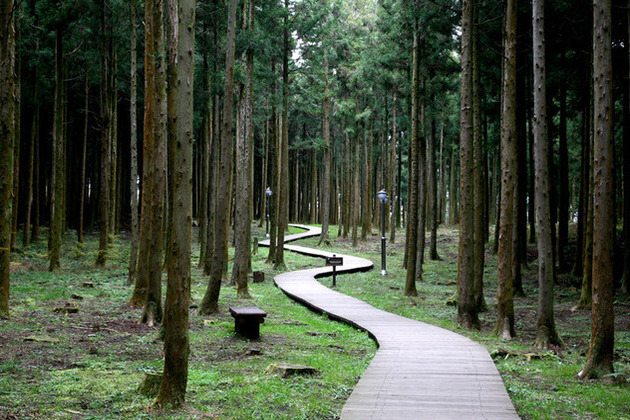 Hallim Park is one of the most attractive places in Jeju shore excursions. 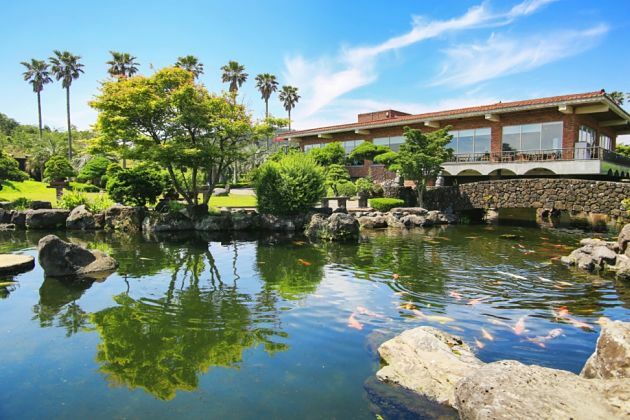 The park is home to various Japanese botanical and bonsai gardens, palm and kiwi fruit garden, a cultural center, a mini folk village, lava-tube caves, and so on. Stroll through to some special subtropical greenhouses covered with exotic fruit trees and aromatic flowers. Especially, sample a glass of fresh cactus juice to experience the quaintest juice ever. Every month of the year you can join in a special festival such as Tulips festival in March, cherry blossoms and canola festival in April, and wildflowers in May. 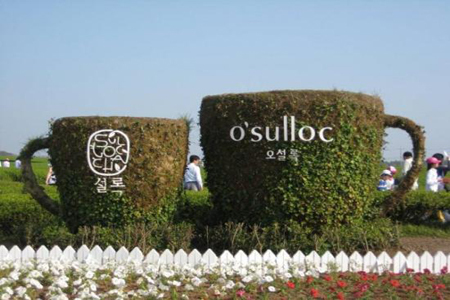 Moreover, have a stroll to the Hyeopjaegul and Ssangyonggul Caves to explore their unique two-dimensional shape. 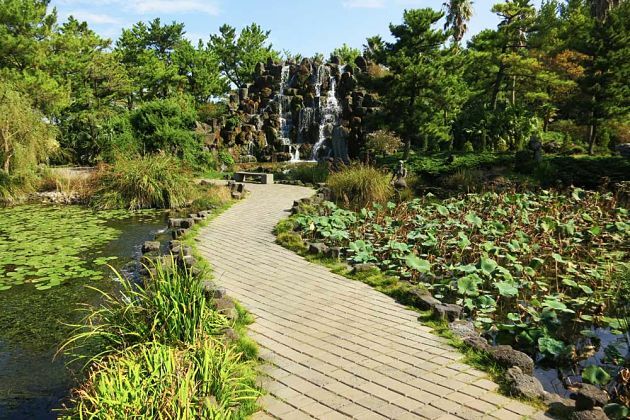 Due to land on about 40,000 square meters, the Spirited Garden included in Jeju day tours is the largest bonsai garden in the world. Surprisingly, this masterpiece was created by a normal farmer moving from the capital of Seoul. The garden is the perfect harmony made from classic walls, crystal clear water, lush green trees, and dark quaint-shaped stone. It is the best place to learn about the bonsai art in growing trees. The magnificent highlights of this garden are its structures including walls, ponds, bridges, and the largest artifact waterfall which were all created by imagination. The garden clearly reveals the idea of what we can make if we have the conviction and passion leading to the goal. 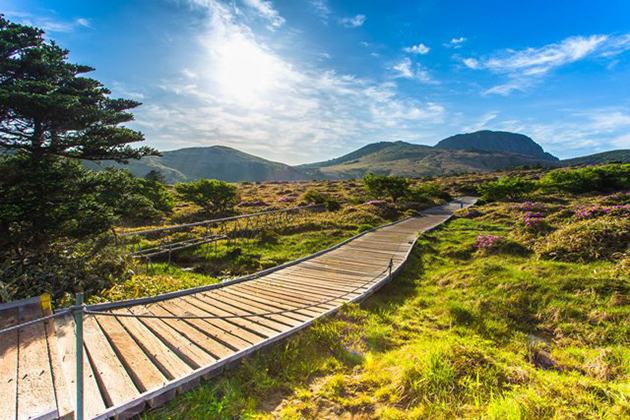 Being a symbol of the island, Songaksan Mountain is a must-visiting place in any Jeju shore excursion. Also has the name as 99 Peaks with the main peak rising 104 meters above the sea level, the mountain is a parasitic volcano which plays an essential role in the geological formation of the whole island. Standing on the top of the mountain on the clear days, the view is fantastic with many islands nearby including Marado, Gapado, Hyeongjeseom, and especially the deep blue Pacific Ocean. Trek through the Olle trail leading around the cliff and to the crater where you can grasp the entire stunning scenery. Jusangjeolli Cliffs have the age of around 250,000 - 140,000 years ago formed by the lava erupting into the sea of Jungmun. Hundreds of rock pillars with the shape of cube or hexagon. Admire the splendor sight over the ocean when the high crystal waves crashing into the cliffs. 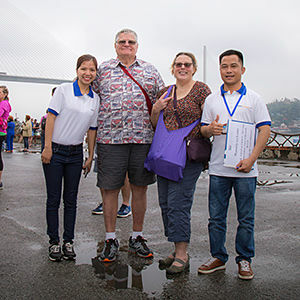 Reaching the observation deck, you can get an overview of the pillars standing strongly and fortified although being heavily affected by corrosion and weathering of the ocean. Jusangjeolli Cliff provides a gorgeous, warm, and inspired view with the stunning red sunshine reflecting the deep blue ocean. It is definitely a masterpiece created by the power of nature.